The Department of Veterans Affairs (VA) blocked the release of the names of hospitals where 19 veterans died because of delays in medical screenings, leading to calls for transparency from news outlets and a bipartisan group of Capitol Hill lawmakers. Earlier this month, the VA denied a Freedom of Information Act (FOIA) request from Tampa Tribune reporter Howard Altman, who had been investigating the deaths. CNN reported in January that 19 veterans died as a result of delayed gastrointestinal cancer screenings, while another 63 were seriously injured. CNN obtained internal documents from the VA listing the number of "institutional disclosures of adverse events"—the bureaucratic phrase for a mistake that gravely harms or kills a patient. However, the documents did not list the names of the hospitals and clinics where the deaths took place. When Altman asked VA for the names of the hospitals, he was told he would have to file a FOIA request. His subsequent FOIA request was denied. "The VA needs to drop the secrecy routine and remember it’s a tax-funded organization that should conduct itself in as transparent a manner as possible without encroaching on patient confidentiality," the Tampa Tribune wrote in an editorial Thursday. The House Committee on Veterans Affairs launched a website this week highlighting the VA’s habit of not responding to press requests. The committee also has 70 outstanding requests for information from the VA.
A committee aide told the Washington Free Beacon the lack of transparency raised many troubling questions. "We have these deaths that we know they occurred, but we don't know the medical facilities where they occurred," the aide said. 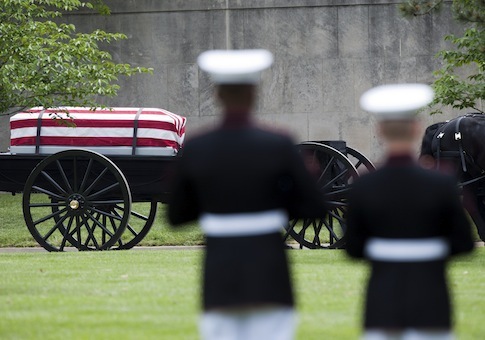 "Are the people who presided over these deaths still employed at VA? Have the problems been fixed? Without the locations, we have no idea." Sen. Bill Nelson (D., Fla.) also demanded more information from the VA on the deaths in a letter released Friday. "Veterans across this country have a right to know about their local VA facility’s record of care," Nelson wrote. "They cannot be adequately served if they do not fully understand their benefits and in some cases, are not fully informed about the care they need." The VA’s rejection of Altman’s public records request also raises questions about its compliance with FOIA. The VA inappropriately denied Altman’s request, according to FOIA experts the Free Beacon spoke to. The VA withheld the information under Exemption 5 of FOIA. Exemption 5, often called the "deliberative process" exemption, exists to allow government employees to give candid advice to each other on policy decisions. However, it has become one of the most used and abused ways to hide documents from the public. Nate Jones, the FOIA coordinator at the National Security Archive who wrote this week about the marked increase in agencies citing Exemption 5 to hide information, said the VA’s response did not seem consistent with the Obama administration’s vaunted transparency directives. Jones noted that President Barack Obama and Attorney General Eric Holder instructed federal agencies in 2009 not to withhold information merely because "public officials might be embarrassed by disclosure, because errors and failures might be revealed, or because of speculative or abstract fears." "It looks like Veterans Affairs may be abusing [Exemption 5] to do any or all of these things," Jones said. "Abuses like this underline why statutory reform of [Exemption 5] is required." Anne Weismann, the chief counsel of Citizens for Responsibility and Ethics in Washington, D.C., said the VA's response "is completely unjustified as to the names of VA hospitals where these deaths occurred." Both Weismann and Jones said that strictly factual information, such as hospital names, is not exempt from disclosure and must be released. However, the VA argued the information is preliminary. "The specific information that was requested is preliminary and has not been validated and finalized," a VA spokesman told the Free Beacon. "That information would include possible locations where consult delays may have occurred, as well as actual numbers pertaining to delays. Until the Department has reviewed and validated the preliminary data, VA’s FOIA Office has determined that it is part of the deliberative process. Because of potential variances in the preliminary data, premature release of this information would inaccurately inform the public concerning this matter. VA is committed to providing complete and precise data about this extremely important issue." In response to the news reports, the VA has said it conducted a nationwide survey of consulting practices at VA hospitals and clinics to address the problems. The VA denied or ignored all requests from CNN for interviews with top officials at the department. This entry was posted in Issues and tagged FOIA, Transparency, Veterans Affairs. Bookmark the permalink.